- No, perhaps you haven’t understood, says Per Gessle to P4 Extra. He has recently come back from Australia and New Zeelend together with Marie Fredriksson. He hardly managed to sit down before Lotta Bromé asks him why he looks so thin. - You look so thin, do you train or what do you do, you look like a stick. But no, Per Gessle doesn’t keep any diet. - I don’t do anything special except playing in the evenings and it is quite stressful. Believe it or not, once I weighed myself before and after and it was a difference of two kilos. This tour is the biggest Roxette tour ever. When Per Gessle and Marie Fredriksson are ready, they will have played for about half a million people. - In Australia there is a quite new generation of fans. There you can see T-shirts with Roxette in the street and that is not so common in Sweden nowadays. What kind of normal life he lives when he is at home in Sweden is also something that Lotta wonders. - What a normal life means, answers Per. - Yes, for example to leave and take the kids from daycare, says Lotta. Gessle says as well that cooking or washing the dishes may not be his strongest side. But when he is at home, his wife, Åsa, says that it is him who lays the table. He is careful and calls himself pedant. Where does it come from? And does it have to do with the fact that he has become like that? Gessle says that he was a huge supporter of glam rock when he was little and he knew very early that he wanted to work with pop music. Because he was useless and pedant, his mother hoped that he would deal with clothes. - I have never been a theatre monkey. 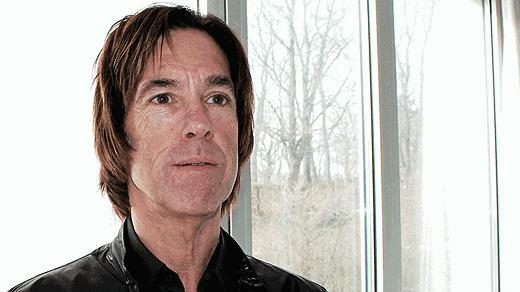 On the contrary, I have always had a creative side that I wanted to show, says Per Gessle. Have you also played with Barbie dolls? Lotta asks. - Yes, I have, I don’t remember their names, but I remember that I cut the hair of one of them. - Marie was “made” already that time, Lotta says. - Ha, ha, yes, exactly, Per says. Per Gessle is a handy man who has written almost 900 songs and who loves everything that has to do with pop culture, including the bad coffee of the pop world, as he says. When he arranges the table in the studio, Lotta invites him to a cup of coffee from the automatic machine. - It tastes like radio coffee, Per says. 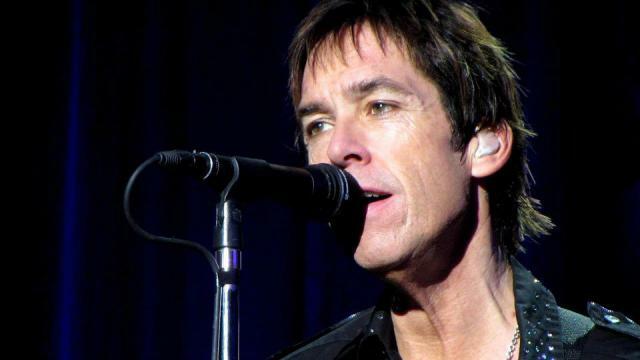 Per Gessle is the son of the plumber from Halmstad who has become one of Sweden’s most successful pop artists. He broke through as singer in Gyllene Tider –‘79 and then he became a huge idol of the teen-agers. He met Marie Fredriksson and together, as Roxette, had a world success in the ’90s. After the year 2000 he was also successful as solo artist, as well as with Gyllene Tider-revival and now he has been on the road again with Roxette for one year. On the 17th April Roxette continue their tour in Caracas and after South America they go to South Africa and Europe in summer. The new Roxette album - Travelling – has already been out since the 26th of March this year. 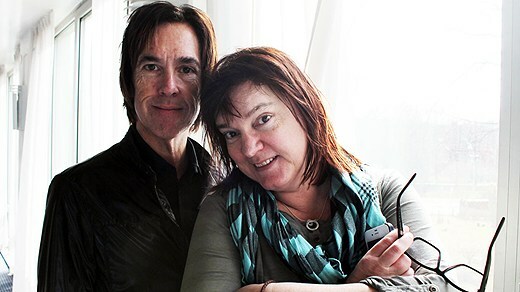 - It's craziness, you have one show and you get two more on the list, Per Gessle says to P4 Extra. Rep: The guest of the day: the son of the plumber from Halmstad who has become one of Sweden’s most successful pop artists. He broke through as singer in Gyllene Tider –‘79 and then he became a huge idol of the teen-agers. He met Marie Fredriksson and together, as Roxette, had a world success in the ’90s. After the year 2000 he was also successful as solo artist, as well as with Gyllene Tider-revival and now he has been on the road again with Roxette for one year. 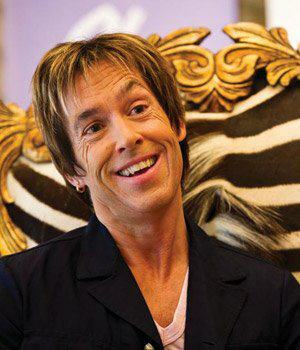 Welcome, Per Gessle! Rep: You were here exactly one year ago and you said that you would go on a world tour, which still continues. Per: It’s craziness, you have one show and two more come on the list. Rep: But how was this year? Was it planned to be like that? Per: No, it was not like that. We just tested ourselves and it just became bigger and bigger. Now we are on our way back to South America. We will play there this spring, we will be there 5 weeks, after Easter. Rep: Now you took a break from the world tour, you have just come from Australia and New Zeelend. Rep: You look so small. Do you train or what do you do that you look like a stick? Per: I don’t do anything special except playing in the evenings and it is quite stressful. Rep: How many shirts do you use one evening? Per: I use three shirts, but they are quite wet, I have to say. Rep: How many kilos do you lose? Per: Believe it or not, once I weighed myself before and after and it was a difference of two kilos. Rep: How do you feel? Rep: There has been quiet in the Swedish mass media if we refer to this world tour. There was no chaos or hysteria. Haven’t we understood here, in Sweden, how big Roxette are abroad? Per: No, perhaps you haven’t understood. I don’t know exactly what was written here, but it is often like that. When you play outside, you become bigger there and less at home. You see the difference when you make a tour in Sweden. Rep: You are doing one of the 10 biggest world tours right now. How is it in statistics? Is it true? Per: It will be, of course. Anyway, for us it is the biggest Roxette tour ever, so we will have played in front of 1.5 million people when we finish. Rep: Marie is not here with you today, but there are many people who wonder how she feels. Per: She feels wonderful, this is the strangest recover in the world and it is still valid. She is like a flower when she is on stage, she gets a lot of positive energy from the audience, she does a great job, she sings fantastically. That is why we have recorded “Travelling” album on tour because she is really brave. Rep: I have to say to the people who don’t remember it that Marie was diagnosed with a brain tumour in 2002, then everything became better in a miraculous way. But does it work like that? Is it like a therapy in a way? Per: I don’t know too much about it, but you can see it on Marie, for example 5 years ago when she was so bad, her self-confidence disappeared and everything. Her ego disappeared and she was not sure if she would come back. I think it’s really great. I think that neither fans nor media had expected that she came back, it’s a miracle, in a way, and it’s really fantastic. Rep: How do you feel as a near friend to her? Per: It is wonderful, like day and night. Rep: Is it the old fans that come to the concerts or did you get a new audience? Per: It’s a mixture, but of course that most of them are the ones who were teen-agers in the ‘90s when we broke through, but there come new people, too. In many countries, for example Australia, there is a quite new generation of fans. You can see Roxette T-shirts in the streets, for example, which you can’t see so much here in Sweden. So that is a great experience. Per: No, I am not 50 anymore, which is an awful truth. I think that when you are on such a long tour, you succeed to know yourself, to know your limits and who you are, in fact. So I try to take care of myself as much as I can. It is not so easy. For example sleep much. What makes you tired is not standing and playing two hours, but travelling and waiting in the airports and, you know, the body clock should be set all the time. Rep: You have a new album now, which you have recorded on tour, Travelling. You have done that before, too, you have written songs while being on tour. Is it the best you have done? How do you feel? Per: Well, at least it is the funniest we have done. The members of the band have been so close to each other for such a long time. So all the positive energy we have used for this album. We have recorded in hotel rooms in Cape Town, in those ballrooms in Sun City, we recorded during sound check in Dubai, as well as in different studios, so it has been funny to record it. I have also chosen some songs that, for one or another reason, haven’t been used earlier, and I have also written a lot of new ones, so there is really much new material. Rep: Where have you recorded “It’s Possible”? Version 1. Per: It is recorded in different places, but most of it has been done in Christoffer’s studio in Skåne. Rep: This is the song which is played on the British radio. “It’s possible”, version 1, Roxette, a song which is played a lot on the British radio, a song which, in comparison to the other songs on the album, has been recorded in Sweden. Ramones? Per: (laughs) Yes, it is so short. Rep: Ramones – both because of guitar tempo and the short duration. Per: Yes, it is not so much Ramones tempo, but it is really short. 2.30, I think it is the shortest single we have released. Rep: And then it’s ready. Rep: Perfect. But it works well, anyway. Who chooses the hits today, you or the audience? Per: I am the worst in the world at picking up hits. I didn’t think that this song should have been on this album. I didn’t even think that it should have been produced. But the others didn’t have the same opinion. “Wish I Could Fly” is another hit that I should have taken away from its album, too. Rep: But, anyway, it succeeded to be No.1. How did it happen? Per: It is because we have a democratic process, namely it is not me who decides everything. “Här kommer alla känslorna på en och samma gång” I took away, too. Rep: “Flickorna på TV2” is another hit that I remember. Rep: Was it not taken away? Per: (laughs) No, even if I was not very proud of it, in fact. Rep: Which is your best song, in your opinion? Per: Well, it’s difficult to answer. The only song that felt to be good since I wrote it was “Joyride”. It felt like having all the ingredients. Rep: The guest of the day, for those of you who haven’t understood yet, is Per Gessle. Four of his songs have got No.1 on the Billboard List in the USA and about 75 millions records have been sold all over the world. So you say that you live a quite normal life, except this year when you have been on tour. What kind of normal things do you do? How does it function for you? Per: What do you mean? That I do abnormal things? Rep: I don’t know. For example what normal life do you live? Per: I don’t know. What is a normal life? Per: Well, I am not very good at cooking and washing the dishes. I can lay the table. I can take away all the “rubbish” from the table so that it becomes clean and nice on the table. I am a bit pedant, my wife says. I just check out so that everything becomes nice and beautiful. Rep: I heard that you are so pedant that you turn the paper roll on the table if you can’t take the paper from the right direction. Per: Yes. I do that. Per: I like it to come from the right side. Once, when I was at Tina Turner’s house, she told me that she had fired one of the employees who used to put the toilet paper on the wrong direction all the time. And I understand that. Rep: So it is you who sets the toilet paper at home so that there will not occur any mistake, I understand. Rep: Shall we make a test to see how much pop king you are? Rep: Yes... Do you have pop art objects on the walls? Per: David Hockney, I think. Rep: He is really good. I have been to one of his exhibitions in Toronto, really really good. Rep: More than 10 guitars at home? Per: You mean plectrum from others? Well, it’s not really a collection, but I have some. Rep: Which is the nicest? Per: The funniest plectrum I had was from a bass player, Neithon East, who played with Phil Collins, because it is written on his plectrum: “bass player for Phil Collins”. Rep: Can’t you do for your band? “Bass player for Per Gessle”? Rep: Do you still have all the vinyl records? Per: I still have 80% of all records. I didn’t save the ones I got from record companies; I was not interested in them. So I still have 2000 vinyl records. Rep: Do I need to ask if they are in alphabetical order? Per: You don’t need to ask because they are, of course. Per: Yeah… what is luxury furniture? Rep: You can do it by yourself. Per: No, I have furniture that fits the house. I like room design and I try to have a nice house. Rep: But what do you do when you are at home? You have an apartment in Stockholm and you live also in Halmstad. Per: We go from one place to another. We have a son who goes to school in Stockholm, so we are mostly in Stockholm. Rep: Do you consume strawberries and champagne excessively? Per: You can never consume that excessively. Rep: Dolly Parton? Do you have a Dollywood like Michael Jackson has in Neverland. Where will Gessle’s park theme be? Per: (laughs) I don’t know… Tylön perhaps. Per: Glamorous? No, I don’t think I have. On the contrary. I was a huge supporter of glam rock because it appeared exactly in the middle of my teen-age. Rep: But is it true that when you were born, your mother, who was an artist, thought that you would become a fashion designer? Because you were already very delicate and careful. Did you dream about that, too, or was it only her who wanted that? Per: Yeah, it was only her. But quite early I wanted to deal with pop music, but I didn’t know exactly how. I have never been a theatre monkey, I was a bit shy and I stayed a bit behind. But I have always had a creative side that I wanted to show through pop music. Rep: Or her flounced-shirt or mocha boots. Per: Yes, I know… useless. Rep: Did you play also with Barbie dolls? Rep: What names did they have? Per: I don’t remember their names, I had some dolls. But I remember that I cut the hair of one of them. Rep: Marie was “made” already that time. Rep: What did this song mean to you? Per: All people who hear the intro and the first line agree that this is the best that exists. It changes everything. Rep: But this vinyl record must still exist among your records. Rep: Then when you were 10 years old, you had already 100 records. Per: Yes, it sounds crazy, but it was like that. I used to sell “Kvällsposten” newspapers in the evenings and the Christmas newspapers on Christmas and all money that I succeeded to gather were spent on records. So that was my only big interest. I remember that when I got 15, I had to choose between a second hand stereo player and a second hand motorbike and of course I chose the stereo player. Rep: Where do you have it now? Per: I don’t know, it’s gone for a long time, I think. Rep: You father, Kurt, died of cancer when you were 19. It was the time when you passed the graduation exam and the newspapers began to write about Gyllene Tider. What memories do you have from that time? Per: It was strange. On the one hand it was very difficult because he died, but at the same time it was a great time because I could experience the fact that Mats Olsson wrote about us for the first time. It was a new world that opened to us; we became quite enterprising and purposeful already that time. We used to send songs to the local radio stations here in Halmstad, to programs like “Bandet går” and all the others. Rep: Has Kurt heard any of the songs? Per: He didn’t think they were so good. There were some songs at “Bandet går” which were good. He thought that I sang awful and I was not good at all for dealing with music. (they laugh) But he was right, I was bad. Rep: But was there no song that he thought it was good? Per: Well, he didn’t comment about that. Rep: How is it to be a “control person”, to have control over everything, over your child… This must have totally changed your life. Per: Yes, it has changed, but I think that when you become older, you are a bit more flexible. You don’t care so much about some things as you did before, but it is also about your personality. I like to have my shirts in order in my wardrobe. Rep: Your wife, Åsa, must be irritated about that…sometimes. Rep: You have been living together for a very long time. Per: Yes, she is a fantastic person. Rep: How does she keep her shirts or blouses? Per: I don’t have a clue about that. Rep: So you have different wardrobes. Rep: Try to check it out! (they laugh) “Lover Lover Lover” – where did you record it? Per: “Lover Lover Lover” – I don’t remember, I think that we recorded it in a hotel room in Sun City. And also here in Stockholm and in Skåne and I think a bit in Halmstad, too. Rep: “Lover Lover Lover” from Roxette’s new album Travelling. The guest of the day here at P4 Extra is one of the two halves from Roxette, Per Gessle. Few years ago there was a discussion about illegal file sharing. That time, Per was against illegal file copy. What do you think about that today? Per: I have the same opinion like before. I think that it is so boring that authors and artists and musicians or the one who cleans in the studio is not paid. Rep: Is that problem diminished nowadays, when we have streams like Spotify and so on? Per: I don’t know if it has diminished, but we live in a time of music consumption and film sharing… you try to find another way of getting it. Rep: How do you buy music? Digitally or how do you do? Per: I am incredible silly, in fact. I buy CD records and I transfer them digitally to an iPod or to the computer. I like the CD-covers, I can say that I am a cover-nerd. Rep: You can see the texts, too. But you can do that on Internet, as well. Per: Well, you can, but it is not exactly the same. You can’t find many old hits, for example. Rep: Do you manage to transfer them by yourself or is it your son, Gabriel, who is 14 years old, who helps you? Rep: Is it him who taught you Tweeter or you knew it? Per: It was him. Well, you get jealous on this generation, because they are so good at digital technique, internet or at doing 4 things at the same time, it feels like that. It is fascinating to see him and his friends, so 4 people sitting with headphones on and communicate. Rep: Would you have liked to be born nowadays or in your time, which is best, in fact? To be a vinyl Per or a technique nerd? Per: Interesting question… if it was better before, I don’t know… I think that every era has its charm, I can say. I am very happy to get everything that I have now. But a person, who hasn’t experienced what I have experienced, doesn’t think about having lost something. At the same time, I can’t really understand the present because it hasn’t been done for me, I come from another world. Rep: What happens when the world tour is ready this autumn? Do you finish with Roxette? Per: I hope not, I hope that we can continue to work and play. I am thinking to try to get a Roxette which doesn't have to go on a 19 months tour every third year. Nowadays the tour shouldn’t be album adapted, we are a greatest hits band when we are on tour, we don’t travel round the world and learn the new album, we play our big hits instead. So I hope we can go on. Rep: On the 17th April Roxette continue their tour in Caracas and after South America they go to South Africa and Europe in summer. The new Roxette album - Travelling – has already been out since the 26th of March this year. Thank you very much for coming here. Rep: And say ‘hello’ to Marie. Per: I promise I will do that. Thank you.